Dhaka – A Dhaka court on Wednesday indicted eight alleged Islamist militants for carrying out the deadly terrorist attack on a restaurant in the Bangladeshi capital two years ago. Officials said a special court accepted the charges framed by the investigators who found involvement of a total of 21 persons in the attacks on Holey Artisan Bakery in Gulshan diplomatic area that left 20 civilians, mostly foreign nationals, killed in 2016. Thirteen of them were killed during the anti-militant drives launched by Bangladeshi security forces following the attack. Judge Mujibur Rahman of the Anti-Terrorism Special Tribunal in Dhaka accepted the charges against the militants – six of whom are in custody while the rest others are on the run. The court also ordered release of former private university teacher Hasnat Reza Karim, who was not found involved in the case. Karim was arrested after his photographs with the terrorists surfaced in the social media. But his name was dropped as the investigators submitted the charges on July 23. The court also issued warrant against absconders asking the authorities to report progress to this end by August 16. The Islamist militants killed nine Italians, seven Japanese, one Indian, one US citizen and two Bangladeshi nationals during a 19-hour siege of the Holey Artisan Bakery in Dhaka’s Gulshan area on July 1, 2016. Two police officers were killed when they initially tried to offset the attack. Army commandos stormed the café in the following morning killing five militants and one of their suspected associates to free hostages. 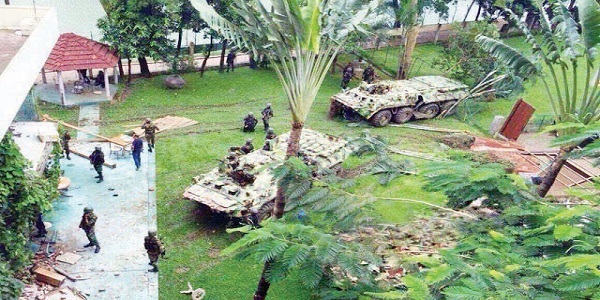 The Islamic State militant group claimed credit for the assault in Dhaka but investigators said the home-grown Islamist outfit Jamaatul Mujahideen Bangladesh (JMB) had carried it out. The security forces killed more than 100 suspected militants in raids launched across Bangladesh in response to the cafe attack in the last two years.